"Have you done your homework yet?" I ask my teenager, whose eyes are glued to his Facebook page. "Nah. Doing it tomorrow. Have an hour break", he mumbles, still staring at that darned computer. "Why wait when you can do it now? ", I start to whine. "Why do it now when I have time tomorrow...?" I think he just stopped short of saying "duh??". Smart move. Before I could hurl a crescendo of life lessons at my darling son, a deafening blast of thunder let out heavy sheets of rain. So much for my perfectly planned sermon on "Don't put off until later what you can do now." I was guilty myself of procrastination! I put off walking to the supermarket all day to buy the remaining ingredients I needed for dinner, and now it looked like this deluge was not about to let up any time soon. Dinner was in an hour. A quick peek in the fridge, and Plan B was made. Salmon, check. Lemon, lots. Maple syrup, yes! This could be the easiest recipe yet. Layer lemon slices on an ovenproof dish. 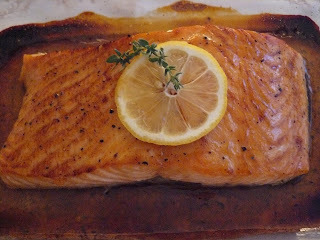 Top with salmon fillets. Season with salt and pepper to taste. Sprinkle with olive oil. Drizzle salmon with maple syrup. Broil the salmon fillets until cooked on the outside but still rare in the center (about 5-8 minutes, depending on the thickness). Remove from oven. 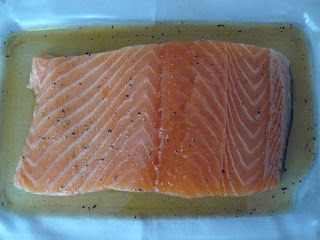 Let salmon rest for a few minutes as it continues to cook with the residual heat. Serve with mashed potatoes.